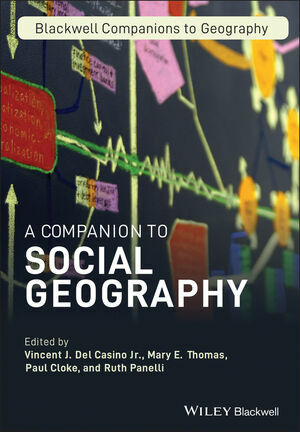 This volume traces the complexity of social geography in both its historical and present contexts, whilst challenging readers to reflect critically on the tensions that run through social geographic thought. Vincent J. Del Casino Jr. is Professor and Chair of Geography at California State University, Long Beach. He has published extensively on social geography, the geographies of health, geographic methodologies, critical cartography, and representational politics. His recent books include Social Geography: A Critical Introduction (Wiley-Blackwell, 2009) and Mapping Tourism (2003). Mary E. Thomas is Assistant Professor of Geography and Women's Studies at Ohio State University. Her research examines racial segregation among US youth populations and the perpetuation of racism, sexism, and white hegemony in the practices of young women. Her book on teen girls, racial segregation, and urban education in Los Angeles, California is forthcoming. Paul Cloke is Professor of Human Geography at the University of Exeter. He has published widely on the social and cultural geographies of rural areas, and is Founder Editor of the Journal of Rural Studies. His recent books include Swept Up Lives? Re-envisioning the Homeless City (with Jon May and Sarah Johnsen, Wiley-Blackwell, 2010) and Globalizing Responsibility: The Political Rationalities of Ethical Consumption (with Clive Barnett, Nick Clarke, and Alice Malpass, Wiley-Blackwell, 2011). Ruth Panelli is former Reader in Human Geography at University College London and is now participating in community work and research in rural New Zealand. She has published writings on responses to individual and collective experiences of difference and her books include Social Geographies: From Difference to Action (2004) and Global Perspectives on Rural Childhood and Youth (ed. with Samantha Punch and Elsbeth Robson, 2007).